LA JOLLA—Metastatic ovarian, prostate and breast cancers are notoriously difficult to treat and often deadly. 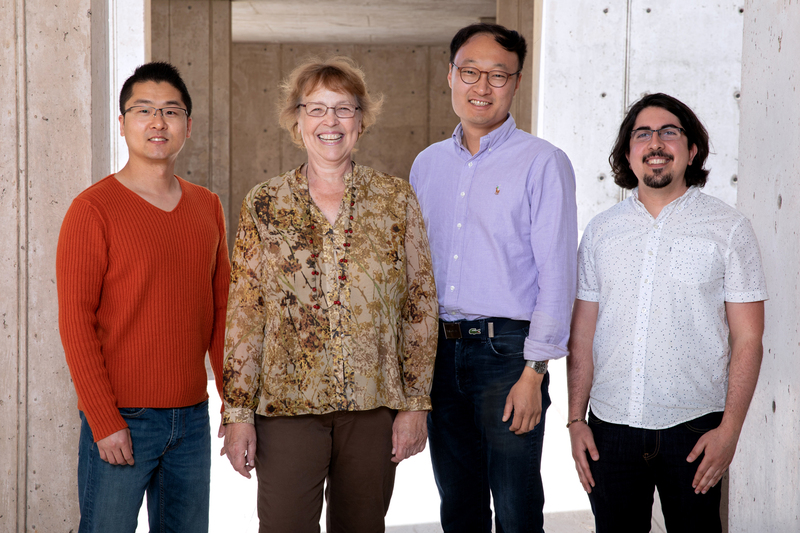 Now, Salk Institute researchers have revealed a new role for the CDK12 protein. The findings were published in the print version of Genes & Development on April 1, 2019. 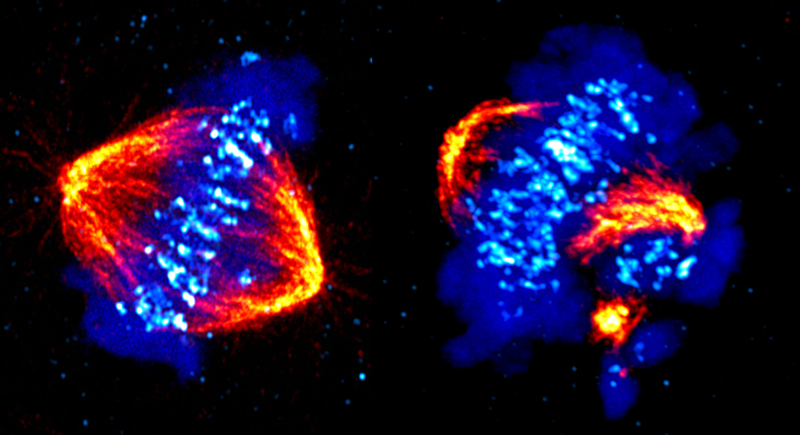 Left: The process of cell division, called mitosis, showing structures called microtubules (orange) pulling the chromosomes (blue) to opposite sides, called spindle poles, of the cell. CDK12 is critical for proper chromosome alignment and progression through mitosis. Right: Without CDK12 the chromosomes become misaligned and detach from the spindle poles. By analyzing the role of CDK12 in protecting the cells from chemotherapy, the team discovered a new group of genes that are controlled by CDK12, including many genes that are regulated by another protein called mTORC1, which controls cancer cell metabolism. And although CDK12 is predominantly located in the nucleus of the cell, it works with mTORC1 to control the process of translation—an important step in creating a new protein within the cell. From left: Seongjae Kim, Katherine Jones, Seung Choi and Thomas Martinez. 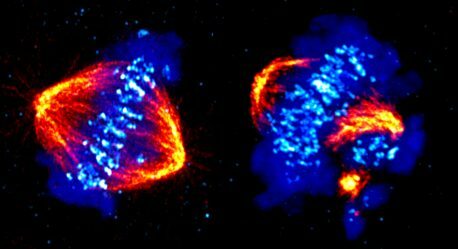 To the surprise of the researchers, many of the other newly identified CDK12-regulated genes were critical for cell division (mitosis). Microscopy imaging studies by Seongjae Kim, a postdoctoral fellow at Salk, revealed that CDK12 helped the chromosomes condense and then separate to become two distinct cells. This role for CDK12 in the expression of a whole network of genes necessary for mitosis was entirely unknown.